Fireplace blowers are commonly called names such as (fireplace fan, fireplace heater, fireplace circulator, fireplace heater blower, heater fan, fireplace blower fan, squirrel cage blower, fireplace blower insert, forced air blower, fireplace insert blower, tangential blower, forced air fan). 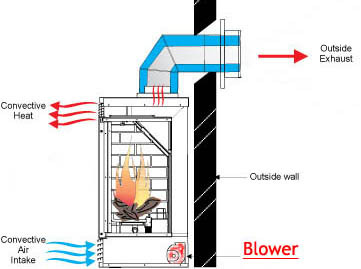 Most fireplace blowers and fans are used in a prefabricated fireplace insert. Fireplace inserts with blower can dramatically improve the efficiency of the warm air circulating into the living space and will save energy. Fireplace inserts have a Firebox which is surrounded by a steel shell. Air from inside your home flows into the shell, is heated and then redistributed back into your living space. Fireplace blowers and fans will work in wood burning fireplaces, gas fireplaces and electric fireplaces. Both wood burning fireplace insert and gas fireplace insert have multiple types of ventilation structures. There are 3 main types of fireplace inserts; Direct Vent Fireplaces, B-Vent Fireplaces (Natural vent) and Vent Free Fireplaces (Ventless Fireplace). Underneath the firebox in a Gas fireplace or Wood fireplace is the space typically where the installation of the blower fan is. If you previously have had a fireplace blower installed in your fireplace insert and need to replace just the blower or fan, click on the Replacement Fireplace Blower and Fan Section link on Left side.